Sukkot 2014: We didn’t survive; we thrived! Romans 1:20 declares that–paraphrase mine–Creation demonstrates Yah’s unseen attributes, His eternal power and divinity. For those of us from the Vineyard Hebrew Christian Fellowship, who camped out in Elizabethton, TN for Sukkot 2014, Yah’s Ruach (Holy Spirit) manifested as wind, His instruction and commandments as rain. (Deu 32:2) We didn’t survive; we thrived! Pastor Matt and several others set up on Wednesday, Oct 8th, a day early. I arrived mid-afternoon, Thursday, figuring I’d have ample time to put up my tent and camp kitchen before the first day of Sukkot—a Sabbath—began at sunset. And I would have, except for the storm. Within fifteen minutes of my arrival, Deacon Chris called Pastor Matthew, alerting him of an eminent squall. We camped out for the eight days of Sukkot, plus the weekly Sabbath, and it rained every day except one. On Monday night gale force winds raged. Pastor Matt and many of our men stayed up all that night literally holding down the camp. The next day, Pastor zonked out on one of the sofas in the house for a couple of hours, wasted. Poor Deacon Chris, with bloodshot eyes, went on to do a full day’s work. But the spirit in our camp never dampened for long. We worked, we played, we ate, occasionally rubbed each other the wrong way, but always got over it, and most of all we worshiped, both the kids and adults alike. Richard, Deacon Chris, and Tom–known now and forevermore as the Remnant–introduced their new song, Come Out OF Her My People. It was an instantaneous hit, destined for a number one slot on the Christian music charts. Our enthusiastic cheering demanded they play an encore in which we all sang the chorus. I conducted a class on defending Hebrew roots via a bit of theater, with several people taking turns playing the Protestant and the Ephraimite. Pardon the un-kosher phrase, but what hams! Gloria demonstrated how to use natural products for cleaning. Hydrogen peroxide removes all sorts of clothing stains, and for the house, baking soda and vinegar are tougher and safer than bleach. James taught young and old how to make tzitzits. Jessica taught Hebraic dance. Charity held a Challah baking class, and that night we enjoyed her efforts. But due to the weather some classes got canceled, like shofar blowing and my Chiastic structure. The night after the big wind storm, we gathered to watch the video, Let the Lion Roar in the big ministry tent. The next day it met its demise. For in the afternoon, the winds grew fierce. In what became a group effort, we dismantled it to prevent the tent from becoming a guided missile. This time, no amount of duct tape could save it. But even with all the rain, our spirits never dampened. During the day we took turns reading through Deuteronomy interspersed with midrash. And on nights we were unable to gather outside around the campfire, we assembled in the house for praise and worship. And worship we did. So many times we entered beyond the veil. These times were glorious. Friday night in particular, as Sukkot ended and the weekly Sabbath began, under heaven’s stars, the Davidic dancers praised Yah with their choreography. The atmosphere was celebratory! Exuberant! With joy in the camp, we surrounded the praise team, a huge camp fire blazed behind us. Five minutes into singing Holy, Holy, Holy, an otherworldly transition occurred. Voices, all voices, grew angelic, with new heavenly harmonies. We were in the throne room, in the Holy of Holies. Nothing compared! When it finally ended, our love feast began. Sitting around the campfire, everyone took a turn sharing. We told of our appreciation and love for one another, sharing special moments that had occurred not only during Sukkot 2014 but during the entire year. We bonded. We were echad—with one another and Yah—He in us, we in Him! In closing I must return to that second night, to my saga, to the lesson I gleaned from how the men saved my tent. 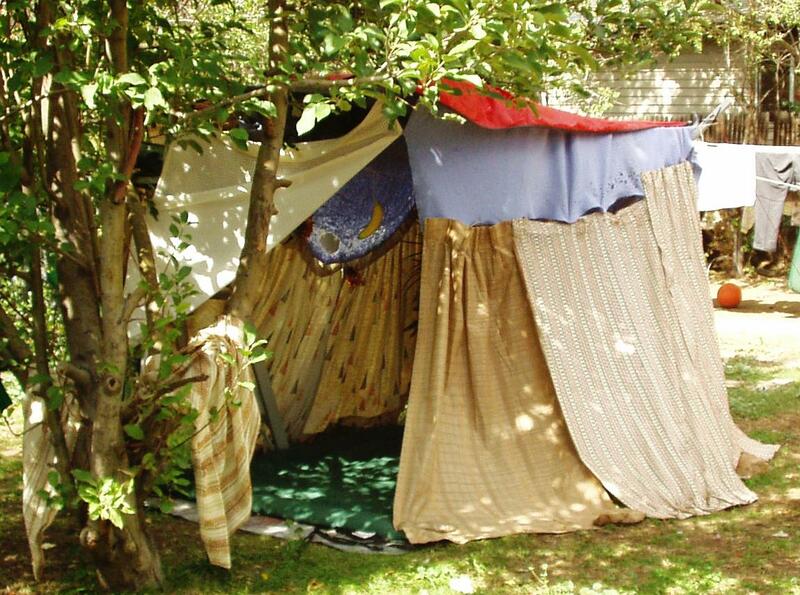 I, a proud three year veteran of camping out for Sukkot, had failed to bring a covering tarp. I had one on the ground under my tent, but had left the top one at home, the one I needed as a protection from the weather. Why? I had no room in my over-packed car, which contained a portable closet. So much for my priorities! Then, to make matters worse, my tent faced up the hill, its door a receptacle for the rain. So by the second day, my tent flooded. But Ken Fabbri and his blessed band of brothers came to my rescue. The sight of these men working as a team in the rain reduced me to tears. They re-oriented my tent, facing it downhill, secured it with sturdier tent pegs, and then covered it with tarps, too many to count. By the time these servants of the Most High had finished, mine was the most secured tent in the camp. Ken went so far as to provide a heater to remove all moisture from the inside, while his dryer at home unsaturated my soaked pillows. In reflection, the spiritual insight I gleaned watching these beautiful brothers turn my tent around, anchor it with sturdier pegs, and layer it with tarps is as follows: The Feast of Sukkot provides us, year after year, an opportunity to rehearse living in community, in the camp of YAHWEH. We can’t be loners! We need each other as we prepare for the tribulation. The tent’s reorientation symbolized teshuvah (repentance, turning around, returning to YaHWeH). The sturdier tent pegs represent TORAH! For it is His WORD that anchors us so we won’t be blown about by every wind of doctrine. And the tarps, the coverings, represent God’s Glory, which Scripture (Isa 4:5) says covers us like a chuppah. So start preparing for Sukkot 2015 now, and spread the word, invite all your Christian friends to join us and share in our Season of our Joy when we keep YHVH’s Feast: that appointed time with our FATHER and KING.